Works in progress | In the Crayon Patch.. I broke the 5th metatarsal in my right foot 2 months ago, which meant I could hobble to work and back, but otherwise I spent a lot of time at home. The upside is that I managed to move a few quilts closer to completion… and start a few new ones- yeah! First, I got more work done on my HST quilt made with Cherrywood fabrics. I’ve got LOTS of blocks made, but still not enough for a generous-sized quilt for our bed. It is on hold until one last bag of scraps arrives, but I have settled on the final layout of the quilt. This is the centre block, below. The rest of the quilt will be more rows of the mid-size blocks. I am loving it! Every year I make one quilt for our guild’s community quilts program. They supply the fabric, you make the quilt. Last year I picked up a pile of red, orange and yellow fabrics from them, and I do love star quilts, so here it is! Sandy Lindal of Scrappy Gal Quilts did a fabulous job of quilting it, and turned it into a stunning quilt. Hopefully someone will cherish it for a very long time. 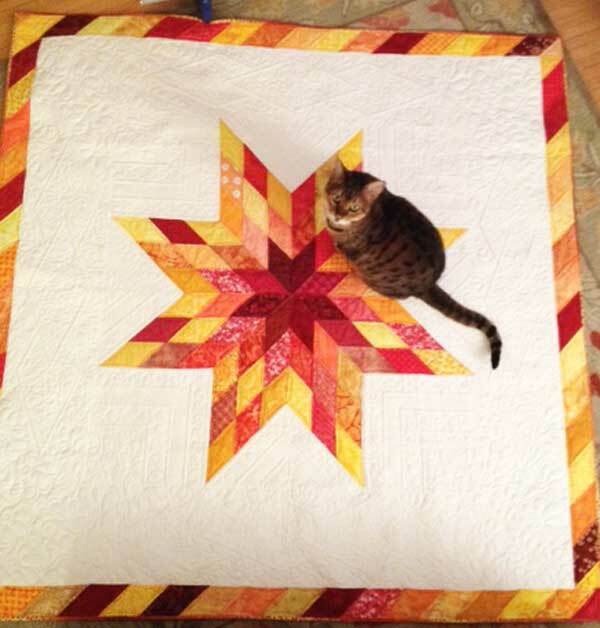 (The cat does not go with the quilt!). I seem to have collected a lot of teal/turquoise fabrics over the years, and it is time to start using them up! I am making my favourite kind of quilt- a one-patch with a restricted colour palette, lots of variations in hue and saturation. Hoping to make this to fit a double bed. There are probably a few other things starting to take shape that I will share when they get a little further along.. I do love making quilts!